Maintaining a good business reputation was once reliant on good service, solid products, and a bit of word-of-mouth review. Now, thanks to the sustainability of the internet, a business’s reputation can be damaged by a review or incident that happened a decade ago. Getting noticed online can be difficult enough, and bad or fake reviews or an accident out of your control shouldn’t be the first item people find when searching your business online. Reputation management is a service with many facets, layers, and tools. The first, and maybe most important, opportunity for business reputation is in search engine results. Often people are searching for a service, not a specific business. The higher your business appears in a search results list the more likely someone looking for the services you offer will choose you. However, if someone does search for your business and the search bar autofills with your business name followed by something such as “lawsuit,” there’s a good chance the user will click on that choice to find out more. This situation is fairly easy to remedy, but it takes time and strong understanding of how search engines create suggestions. 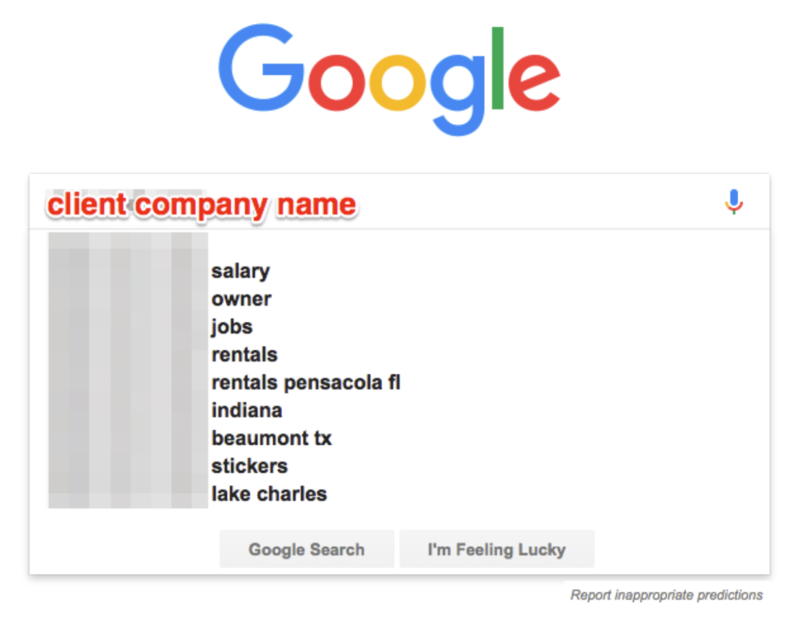 Envoc recently worked with a client to remove a search suggestion from Google, and we had some promising results. Our client, who must go unnamed for obvious reasons, is a fine company and has a great record of service. However, there was an unfortunate, fatal accident involving one of their employees in 2008. 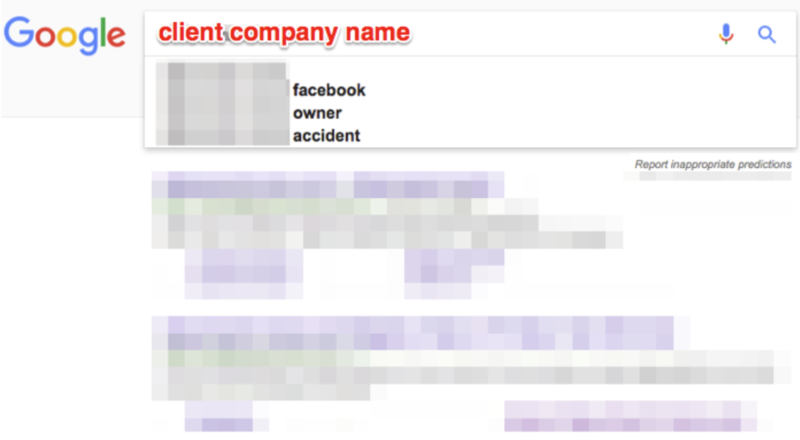 The accident was covered by multiple news outlets and the company name became associated with the word “accident.” Anytime someone searched for the company name, the name was always accompanied by “accident” in the Autosuggested keywords, which overshadowed any of the positive attributes of the company. What’s worse is that the word was still being autosuggested with the company name 10 years later. Not only was the negative “accident” query costing the company to lose potential clients, the accident was an unfortunate and solitary part of the company’s history that should not define their reputation. The company sought our help to remove the word from the Google Autosuggest, and we offered a six-month plan. While six months might seem like a long time, the word hadn’t budged in ten years, and probably wouldn’t go away with organic searches. In effect, the word’s appearance was perpetuating itself, growing stronger every time someone chooses it from the Autosuggested list of search options. Our plan involved analysis into the most popular keywords associated with the company name, with their competitors, and required other algorithm metrics. After the lengthy research, we introduced six new keywords over a period of time. Within the six-month plan, the word “accident” was successfully removed and replaced with positive or neutral phrases of our choice. The company’s online reputation matched the true level of their professionalism and safety. After ten years, anyone searching for the company name would not be reminded of the unfortunate incident and only see the services the company offers. There are many other ways a business’s online reputation can be negatively affected. The Autosuggest is just the tip of the iceberg. Everyone has an opinion, and it’s easier now than ever to share that opinion with a greater number of people. Reviews are a double-edged sword, and some people enjoy leaving fake reviews for companies. There are an uncountable amount of business listing sites (kind of like the yellow pages), and a company can be listed without being notified. The reality is that the internet is a big place and it’s near impossible to control your online reputation without scouring the internet or knowing the backdoors to finding every instance of your company’s name. If you have an unfortunate keyword appearing with your company name, or you want to boost your standing in search results, Envoc has the experts who can clean up your reputation and highlight the positive aspects of your business. Contact us for a consultation.